I’m really pleased with the programming for Verve 2019, as I think we have taken a big leap forwards in ambition and scope. We have commissioned more than ever before – including a brand new theatre poetry piece from last year’s UniSlam winners, now called The Second City Poets, and the first in what I hope will be a recurring feature – The Verve Performance Lecture, this time with Anthony Anaxagorou. We have made better connections this year, forming good partnerships for events with Poetry School, UniSlam and Sabotage Reviews. Unislam are bringing some wonderful former judges to their showcase such as Debris Stevenson and Roger Robinson, and we will also feature this year’s UniSlam champions and The Verve Individual UniSlam Slam Award winner. Personally, I am also thrilled with the number of single poet events we have programmed this year, from Verve Poet of The Festival Sumita Chakraborty reading her long poem “Dear, beloved” in its entirety, to Owen Sheers performing large extracts of his wonderful film poem, “To Provide All People”. 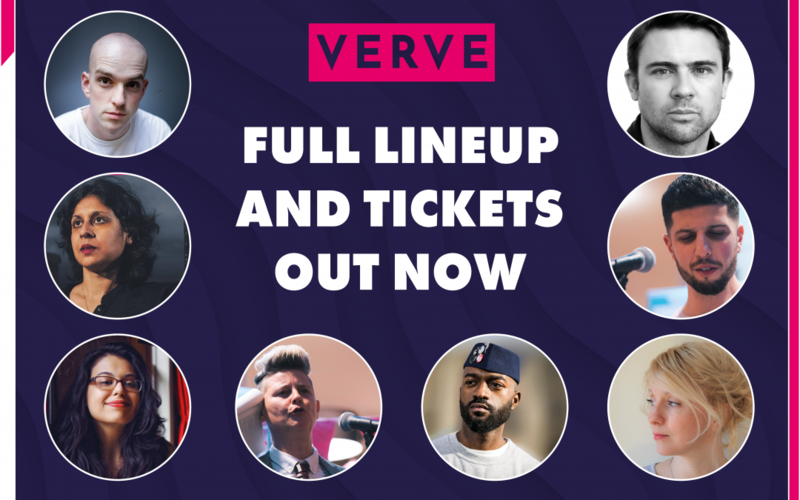 Add to this all the other colourful, energetic and engaging events that we always have, featuring wonderful poets such as Inua Ellams, Andrew McMillan, Vahni Capildeo, Sophie Collins and many many more, and you can see why I’m so excited for Verve 2019!